Designers can now test out the thousands of webfonts from FontShop.com on existing websites, free of charge. FontShop International is pleased to introduce its WebFonter tool available at webfonter.FontShop.com. Aiming to make the web design process as seamless as possible, WebFonter allows designers to “try before they buy,” by previewing actual typefaces in any existing site. The tool can be used as a Chrome extension, browser bookmarklet or by entering a URL directly at webfonter.fontshop.com. By pairing Webfonter with the FontShop Plugin, designers can now easily preview fonts in the concept stage of design from print to web. Still confused about webfont licenses? Here are our top five Buyer’s Guides to common questions about webfonts on FontShop. Learn the difference between the two types of webfont hosting. 2. How webfonts are licensed. Discover who should be licensed and how. 3. What formats are webfonts available in? With @font-face you can use various formats, but your license may only cover specific ones. 4. Can all webfonts sold on FontShop be linked to Typekit? Tips on how to recognize webfonts that can be brought into a Typekit account. 5. Can I install EOT or WOFF on my computer? Find out if you need a desktop license too! As a bonus, check out out our education page where you can find tips on how to use type in print and on the web. And if you have additional questions you can always email FontShop’s Support Team for help. Webfonts are here to stay, but there seems to be some confusion on how webfonts are licensed and implemented on a site. You have two basic options, Hosted or Self-Hosted. Below are some basic things to know. You are charged based on the number of pageviews per month your site has as a one-time fee. You are given the EOT/WOFF files to self-host on your site. You keep track of the pageviews per month your site receives. You can extend your license to support more pageviews by contacting FontShop. You are charged based on the number of pageviews per month your site has as a subscription based model which can be annual/monthly depending on the provider. You are given a line of code to include within your site that serves the fonts to your site. The service provider keeps track of the pageviews per month your site receives. If you go over your pageview limit, default fonts may be served until you increase your subscription terms. Buyer’s Guide: What formats are webfonts available in? Typically, webfonts are available in EOT and WOFF formats — if you don’t know what these formats are, you can check out our “What is EOT and WOFF?“ post. FontShop‘s webfont selection is limited to the formats that the foundries supply and is not available in TTF or SVG formats. Under many of the foundries’ licensing terms, converting fonts to other formats for web use is not allowed. Always double-check a foundry’s End User License Agreement to be sure what is and isn’t allowed. Buyer’s Guide: Can I install EOT or WOFF on my computer? 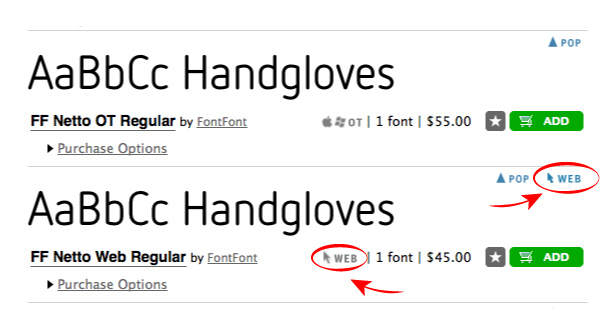 Keep in mind that desktop fonts and webfonts are not the same! Desktop licensing and web licensing are completely separate, so if you’re planning on using something like FF DIN for a big project that includes print materials and a shiny new website, you’ll need to license both the desktop version (OpenType or TrueType format) and the web version (EOT and WOFF formats). If you have only purchased a webfont, you will not be able to install the webfonts on your computer. Webfont formats — EOT and WOFF — cannot be installed on Macs or PCs. A webfont will not work in desktop programs like InDesign or Microsoft Word. If you need a version to install on your computer for mockups or wireframes (in Photoshop or Illustrator, for example), you can use our Plugin to test out fonts in Adobe® Creative Suite® — it’s free and easy to use! Buyer’s Guide: Can this webfont be linked to Typekit? Update April 2016: Recent changes to the FontShop website have temporarily made this automated “Bring Your Own License to Typekit”unavailable. To use your Web FontFonts on Typekit, visit your order history and click the green button to request a Typekit web voucher. Currently, you can only link webfonts from FontFont (also known as Web FontFonts) — webfonts that begin with “FF” in their name, such as FF Meta Web or FF Suhmo Web — to your Typekit account. At this point, you will be able to double-check to make sure you are linking the correct Web FontFonts to your Typekit account. You can then sign in to your Typekit account or create a new account. If you don’t find a yellow box with a link to send your webfonts to Typekit when you’ve completed your purchase, you can still use webfonts. Remember, Typekit is completely optional and all webfonts on FontShop can be self-hosted! Double check the fonts in your cart before licensing them to make sure you have the format you need or the format that has the best compatibility with the system or programs you’re running! 2. What is EOT and WOFF? Increase your understanding of the web formats available before licensing fonts for the web. 3. Can All Webfonts Be Linked To Typekit? You’ve learned the difference between desktop licensing and web licensing and have decided you need to purchase some webfonts. If you have a Typekit account, read this Buyer’s Guide tip to make sure if the webfonts you want can be linked to your Typekit account or not. Still haven’t gotten gifts for a few people on your list? Don’t worry, you can buy fonts for them — that way, you won’t have to deal with getting out of your pajamas and trying to find parking in crowded shopping lots the day before Christmas. If you have any other questions about buying fonts, you can view our Buyer’s Guide posts or our Help Topic forums. FontShop is always here to help. Happy FontShopping! We’re rounding up previous guides to help you demystify licensing webfonts on FontShop. Need help finding webfonts on our site? Read am I buying a webfont? Confused about what webfont formats are and how to use them? Then check out what is EOT or WOFF. Don’t know the difference between a desktop license and a webfont license? 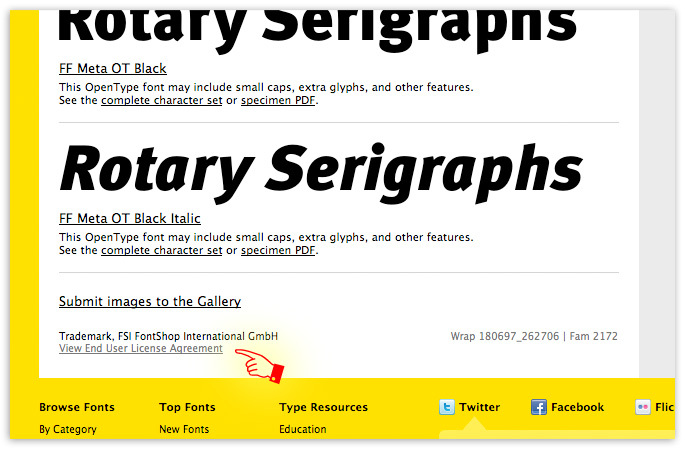 Read up on how our webfonts are licensed. Do you have a Typekit account and you want to link your webfonts to your account? Then find out if your webfont can be linked to Typekit. He only noticed the effects of it over time, more like arsenic than the guillotine. Something so beautiful and young shouldn’t have to endure wearing such a horrific mask, when its real features are much bolder. But how could he have known? He wasn’t used to working in this platform and he realized his fatal error much too late. He didn’t mean to inflict such a slow death on web typography. Faux bolding and faux italic is a common crime for designers using webfonts. It happens by not specifying the font family properly. Instead of showing a true bold or a true italic, the browser or renderer will embolden or slant a regular weight. You can fix this issue by defining your font family properly in the CSS, including links to each font that will be required. Since FF Chartwell’s May release, the design world has been abuzz with accolades for its unique approach to infographic creation. With the recent FontFont release, web designers can now rejoice – FF Chartwell Web is here! Get FF Chartwell Radar Web free! Back in May we first introduced FF Chartwell’s nonconformist approach to creating charts and graphs: simply type in the numbers and let the font do the rest. Rings, rose, radar, pies, bars, lines, and vertical bar charts, all as easily styled as type, result automatically. Use FF Chartwell Web with static text or real-time data. Web designers can test FF Chartwell Web on the FontFont How To site’s live demo. We can’t wait to see the beautiful infographic websites that FF Chartwell is bound to inspire. Please share your creations in the comments! In the past you only had to worry about basic desktop licenses, webfont choices were limited to system fonts, and designing for mobile apps wasn’t a priority. Now you have to worry about supporting all three: desktop, web, and mobile. But don’t worry, FontShop has got you covered! You can purchase a basic desktop license that allows a font to live on your computer. The software is installed on your system so that you can use the font in various programs, but this license doesn’t include support for web or mobile. Webfont licenses allow fonts to live on your site using the CSS @font-face rule. Take a look at how we label our webfont products and view our webfont license guide for primers on finding and purchasing webfonts. Finally, mobile licenses allow a developer to include Mobile FontFonts into multiple apps, the license is perpetual, and they have web and desktop counterparts. If you can’t find the license you are looking for, FontShop’s support is always here to help.